I wasn’t prepared for that. Once again, the wonderfulness of not having any idea where something is heading is truly my favorite position to be in when walking into the theatre. This was no exception. 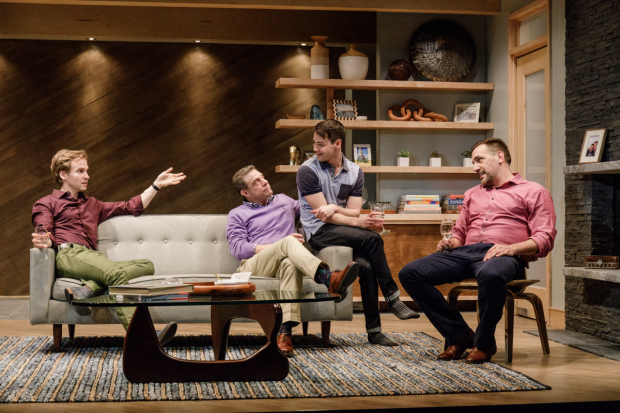 In Michael McKeever’s complex and engaging new play, Daniel’s Husband, we are invited in for a dinner party, the setting that starts numerous other conflict themed drama. As is customary for these types of serious relationship and family dramas, we join the group in a well appointed living room for wine, conversation, and some deliciously sounding dessert. 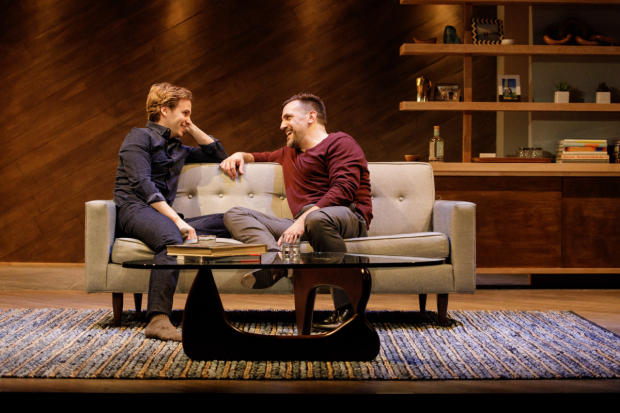 Here, in this timely play, it is the lovely home of the perfect gay couple, architect Daniel Bixby and his boyfriend, novelist Mitchell Howard (expertly played by Matthew Montelongo). Daniel, keenly and precisely played by Ryan Spahn (Primary Stage’s Exit Strategy) has created a modern clean living environment, perfect for entertaining guests with his loving partner, and on this particular night, they have invited Mitchell’s close friend and literary agent, Barry Dylon, wonderfully played by Lou Liberatore (Broadway’s Burn This) and his adorably young new boyfriend, Trip, the home care specialist, lovingly portrayed by Leland Wheeler (We Need to Talk About Kevin). All is going well, with witty conversations and delicious creme brûlée surrounded by post modern furniture, an old fashioned record collection, a fireplace, and modern art (impeccable design team: scenic: Brian Prather; costume: Jennifer Caprio: lighting: Christina Watanabe; original music & sound Design: William Neal), when Trip mistakenly refers to the perfect couple as a married one. It seems that this is a point of contention, where the conflict between Daniel and his boyfriend lies. Daniel wants the wedding, but Mitchell is adamantly against becoming anyone’s husband, for numerous strongly stated reasons.